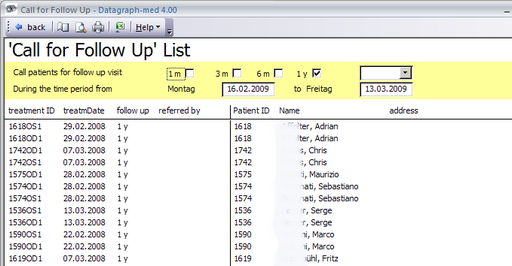 Datagraph-med allows you to create a list of patients where certain follow up data is missing. You may find patients with no pre OP or no PostOp data or which are missing a certain follow up interval. In this example a list was created containing all patients who have been treated a year or more ago and which are missing their 1 year follow up data.